Here is the background to the game and a bunch of general structure etc. I hope to put it all out as PDFs & also as the webpage so you can chose what you find most digestable! There are 3 categories of players; a couple of Journalists, a handful of US Investors & a lot of Mexican General/Politicians. Unlike most megagames the majority of the players are not in teams at the start of the game. Journalists do what they do & the US investors look after their interests & those of the US as a whole, however if we do not get the numbers they will be cut back/out. The bulk of the players are Mexican Generals / Politicians. As there is a culture of electing generals to high offices & power grows from their military strength these players are overwhelmingly a mixture of both soldier & statesman. Players are expected to form political parties as the game progresses - these function as teams & allow them to have greater impact than they do as individuals. The parties will have to choose a leader & a set of policies reflecting their outlook. The leader is their prospective president, or presidential candidate for the more democratically inclined. All this reflects the position in the country at the time. The leading light of the revolution were overwhelmingly unknown non entities before it started. They took up the revolution in opposition to the policies of government, or because they thought they could better in a new regime. In the game this means that everyone starts in a very similar position with the opportunity to do well based on their actions rather than on the power of their position. There is some “history” as the current leaders mostly made their names in the previous wave of revolution in 1910 -1912 so there are existing animosities & the position is not quite a pure carte blanche. There are a couple of parties in existence at the start of the Game. 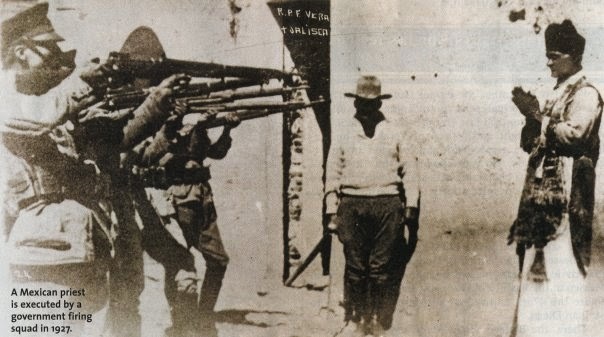 The first of these is the Zapatistas following Emiliano Zapata’s Plan De Ayala. They have been in revolt since the start of Madero’s rebellion having failed to get satisfaction from the previous brief governments. The other party is the Constitutionalist party lead by the Primer Jefe (First Chief) Venustiano Carranza. It was formed following the Plan of Guadeloupe in response to General Huerta’s coup when Carranza was encouraged to promote himself to be the locus of revolution. Note the parties are usually called for their leader the Constitutionalists are Carrancistas. The war is very much about personal loyalties & individuals. Carranza is one of the few established politicians in the game. Any General with government/federal leanings, or actual federales may be in a party too – the effective government is just another big bunch of rebellious bandits. Player briefings will cover your political outlook and any political ambitions that you have with how important these are to you. This will let a player who just wants to be a general to find a nice amenable party that lets them do their thing. A player who just wants to politic can give up fighting & liaise between the members of their party in different places, or try to persuade everybody that they should be the next president, or bash out the next Mexican Constitution. Most Mexican players should expect to do a bit of both fighting & talking. 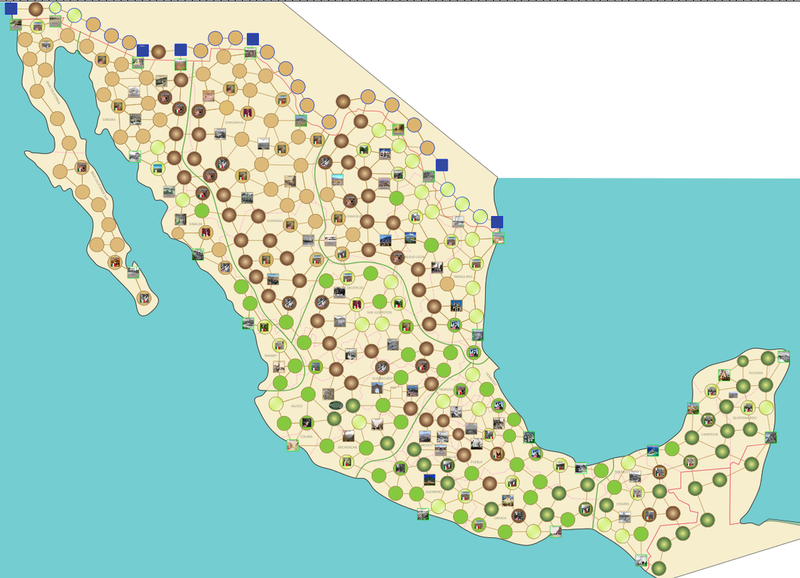 The game is at its core a wargame played on a map of Mexico. This map is split into 7 parts on separate tables each covering an area about the size of Britain. These maps are somewhat isolated from one another by geography or railways & reflect the historical campaign theatres at the start of the revolution. A couple are so minor that they will probably not get used but completeness eh? Players will be allocated to a map to start with but can move around afterwards as they like, though it takes time to move your base of operations. The map is split into areas, either towns or wilderness, about 80 km/50 miles apart. The map, all 7 parts, is off at the printers & I am excitedly waiting for it to reappear! Aside from military action & real politiking the game assume that the players are fighting for a political agenda that will form the basis for a revised Mexican constitution. After all what is the point of replacing the rich old men if they are going to behave the same as the old rich old men? Unless of course you can become one of these rich old men. This game uses a simple system for representing the political agenda with several issues being salient to the population & everyone having an opinion for or against each of the issues. This system has recently been used in other games – Crisis in Elysium & Red Dawn so you may be familiar with it. The Separation of the Military from Politics (which is a mouthful, or "Separation" which is a tad obscure). The first 3 are major being of significant concern to the populace of the day, or in the case of the Church, within a few years. The other 3 are more minor being very important to fewer people, which is reflected in the game. You may even think they are added to split up people on the major issues. Any constitution must state its position on at least a couple of the issues but is likely to get more favour if it is more assertive. Of course, it will also alienate more people. There is no or very little inbuilt consequence of the positions in the game – the timescale is a bit too short & there is a war on! However, the players act as proxies for the populace at large & so they want to get their agenda represented. They are briefed to prioritise the agendas to different extents from “the only thing that matters” to “it would be nice if it was how I like it”. They also have abilities that only work if they belong to a party pushing their agendas, representing a power base in that sector of the population. *A bit like the NHS everyone is in favour of it even as they seek to undermine it. Here is what the issues mean. This is the defining issue of the Revolution. It is so important that everyone is (overtly) in favour of some degree of land reform – it is a matter of how radical you propose to be. The last 40 years have seen a gradual consolidation of land out of the hands of small peasants and into the possession of the owners of huge Haciendas. This has mostly been done legally but the Hacendados certainly have a position of strength to abuse. Ironically it is partly a consequence attempts by the liberal governments of the mid 19th century to create a rural middle class. They gave individual peons ownership of land that had been held communally and so the peons were able to sell this land to the land Barons. Debt peonage, which is virtually feudalism or slavery has increased as there are fewer “free” peasants and more and more have been obliged to work on haciendas. Large land holders have also used denial of water rights & other illegal means to obtain land. For: Land held by Haciendas should be seized & redistributed to the peasants subject to suitable compensation which will be assessed. Against: Claims of the peons will be investigated and land where undue or illegal influence has been used will be bought off the haciendas and redistributed to the peasantry (seized in the case of illegality). A programme of redistribution for the other land will be worked out. Strongly Against: Claims of the peasants will be investigated, and any illegally owned land will be returned to them. Claims for redistribution will be considered on a case by case basis. For Land Reform paraphrases Emiliano Zapata’s Plan De Ayala & Against paraphrases Felix Diaz’ Plan de Tierra Colorada. This was the demand of Madero’s liberal revolution in 1910. Mexico has always had a strong urban liberal tradition add odds with conservative rural elements. The aims of the liberals are to ensure Mexico is a modern democracy. It has always been notionally this with policies of no re-election – president may only serve one term - & universal male suffrage. However every time someone obtained power they have started to subvert this by preventing free & fair elections & by repeatedly standing, see Diaz 40 year reign. This is why “effective democracy” is the crying call – not just lip service to voting. Conservatives tend to believe that Mexicans need a strong leader as they “are not ready for democracy”, both Santa Ana and Diaz expressed this sentiment. If there were some element of truth in this the elites do not address it by education & wealth redistribution they just reinforce the status quo, ensuring Mexico is never ready for democracy. Strongly for: The president must be chosen by free & fair elections by the whole populace as soon as possible. There must be no reelection allowed. Strongly against: Mexico has never had much luck with democracy. The presidential candidate should be chosen from amongst the leading lights of the country. He or at least these leading lights should retain power as long as he can do good for the country. This is a tension between the view that there should be independence of the Army from politics and the view that the spoils of the revolution should be shared by those that fought for it. Mexican has a history of supporting “the man on horseback” into political office and there is a lot of respect in the country for revolutionary generals. Coming with a 21st century mindset there can be some difficulties with these positions. Partly this is because they are a little artificial as created by me rather than expert analysts. Partly it is because our perspective & culture is different. The way we typically bundle viewpoints is different from how they were grouped at the start of the 20th Century especially in foreign parts like Mexico. The combinations of these two specific issues cause most conflict. The obvious combinations to us are probably for both or against both. For Democracy & For Separation is the modern liberal model. It places the army as a tool of state rather than as a tool of the rulers of the state. Against Democracy and For Separation is a non military oligarchy. It has echoes of Plato’s Philosopher Kings or something like the Venetian Republic. Here the military is again the agent of the state, it’s just that the state is run by a very small number of people. There was a claque in the inner circles of Diaz government that held these ideals. Called Cientificos as they, apparently, used scientific methods & reason to determine the best policies – that’s an upgrade to philosophy right there. They believed they were better qualified to rule than someone chosen by a plebiscite. They were politicians & businessmen not soldiers & never a very large group but a significant one. I leave it to the reader to decide how much of this position was for the benefit of the population as a whole and how much was enlightened self-interest. For Democracy & Against Separation is essentially the Mexican standard. While it seems odd to us there was a cult of personality surrounding the leaders in throughout Mexican history. They always elected successful generals to the presidency. The feeling that those who struggle for a cause should be those who lead it was what a large proportion of Mexicans believed, though it is at odds with what we normally think nowadays. Also if you look at the number of US presidents who were successful generals – it’s almost as common there. Possibly the only point that unites the rural poor with the rural rich is that they are more devout than the urban liberals. The Catholic church has been abused at the hands of liberal government throughout Mexican history losing income from land it has lost and fees for performing rites. It lost the monopoly on education and on civil enforcement of tithes. It also has had all of its land disentailed to prop up various faltering governments. However the church is still reasonably strong – the country is overwhelmingly Catholic and the church still educates more people than anyone else. During the Profirista it has been allowed to own property again as Diaz had allies in the church & did not enforce the anticlerical laws on the statures. This friction became progressively more of a live issue in the following decade ending with a huge revolt in 1926-29. Strongly For: Church rights must be protected by the law. Land disentailed from the church will be restored. The catholic faith must be taught in state schools as well as church ones. For: The illegal seizure of church land must be reversed. Catholicism must be enshrined as the state religion and defended. Strongly Against: The remaining power of the catholic church must be broken. They are opposed to revolution and support reaction so seizing all of their remaining property and expelling (or shooting) disruptive priests is the only way to progress. 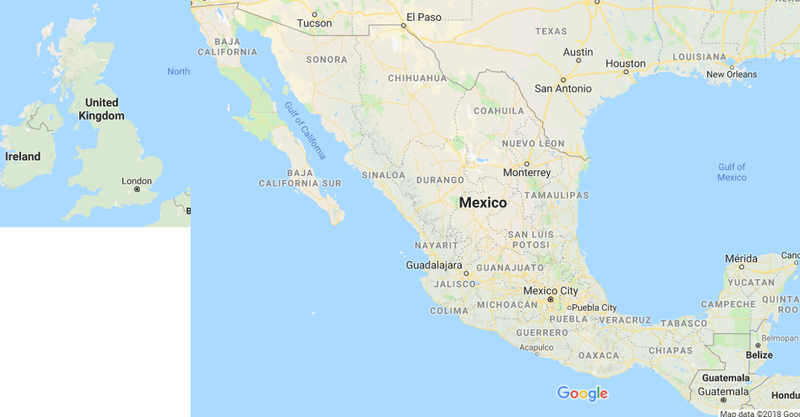 Mexico is a federation of states like the USA. The states have never been as autonomous as even US states but they have some independence. There is a hint of small government/local self determination -> more democracy in this issue too. Strongly For: States are subsumed in the central government. Governors are appointed by the president. States have no rights to raise troops and only small amounts of tax for purely local matters. For: States are a useful layer in administrating central policy. Governors are elected, though a candidate nominated by the president would have a good chance. All policy is determined centrally. The governor may have a small number of state militia but appointments to command these are made centrally and they fall under the command of the Federales. Against: States must retain certain autonomous functions. They can raise some local taxes and use these to fund state militia under the command of the Governor and his appointed generals. They may pass laws that differ from federal law but they will be bound by the constitution and by foreign policy. Strongly Against: All federal law must be ratified by the State or rejected. States reserve the right to adopt different foreign policy to the federal government. This combines two issues the ownership of mineral rights & labour rights. Both of these are bad for overseas businesses, at least those that exploit workers & got land too cheap. They benefit the state & the workers separately in reality but are aggregated here as they are both separately too niche to excite much of the population. Massive amounts of the rights to exploit land have been sold to overseas interests at massive under-valuations in the past 40 years. This has weakened the Mexican state. 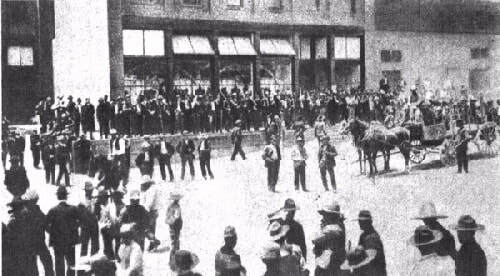 The workers have no right to strike & when they have done so they have been put down violently such as at the Canannea Copper mines in 1906. Workers rights are a new concept in Mexico & they only effect a small proportion of the population - far more are effected by peonage covered under Land Reform. Strongly For: Workers have must have fixed maximum hours, minimum rates of pay & a right to strike. Mexico will forever own the rights to its land. Any that have been passed over to foreign interests will be seized without compensation. Future exploitation will be by licence or by natives. Against: Labour is paid fairly for the work it carries out & business owners must be protected from willful strike action. Land can be owned by anyone fit to exploit it for the good of the country. Strongly Against: Foreign investment should be encouraged as it is to the benefit of the country & selling investors mineral rights at very reasonable rates will help this. Striking should be a capital crime & unions made illegal.